We live a few blocks away from our neighborhood Immigration Market. It is so fun to take family walks there and get their famous gelato and snow cones. It is also nice when I run out of something for a recipe and need to make a quick trip to the store. But they have the best meats I have ever had. Nobody can compare with their quality. We love getting burgers to grill in the summertime. But their salmon. Wow. It is incredible. The guy helping me explained to me the different types that they had and the different benefits. I never had a clue what the difference in salmon was. He picked this one out for me and told me I would love it. Not only was this the best salmon I have ever had, you won’t believe the glaze on this. The honey balsamic glaze was the perfect finishing touch to this salmon. The flavor was absolutely incredible making this an instant favorite. It was flaky, perfectly cooked and had an incredible glaze. If you are a salmon lover like me, you are going to love this one! 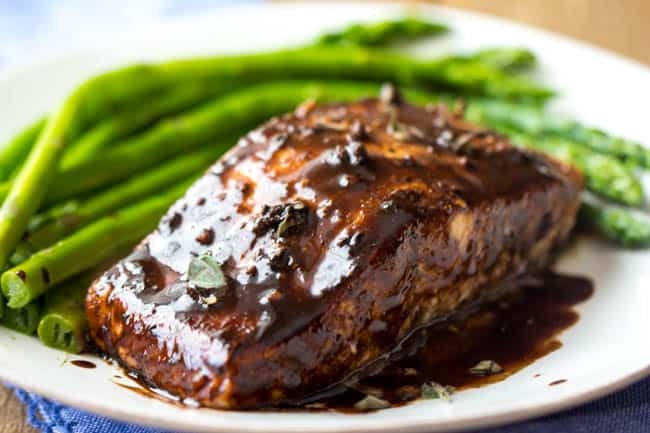 A delicious honey balsamic glaze that makes this salmon incredible! Preheat oven to 400 degrees. Line a baking sheet with aluminum foil and spray with cooking spray. In a medium saucepan cook the garlic until tender in the olive oil about 2-3 minutes. Add honey, balsamic vinegar, dijon mustard, and salt and pepper to taste. Simmer for about 3 minutes until it slightly starts to thicken. Remove from heat. Place the salmon fillets on the aluminum lined baking sheet. 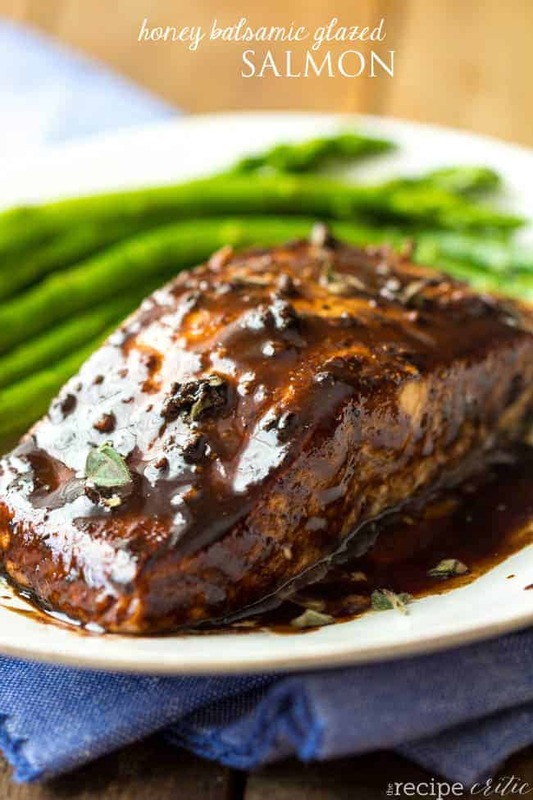 Brush the salmon with the balsamic glaze but reserve half for brushing on a the end. Bake for about 6-10 minutes until flesh flakes easily with a fork. Brush them remaining glaze. Absolutely wonderful. We had this salmon with a rice pilaf and steamed cauliflower and it was the best meat that I’ve prepared in a long time. Great recipe! I had some frozen blueberries (1 cup), so I put a little sugar on them as they were defrosting and added them to the glaze at the end. It was AWESOME! This recipe was delicious. Love the pairing of the balsamic vinegar with the salmon. So simple and quick with a few ingredients.